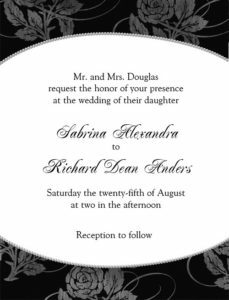 Your local printing company in Northeast Johnson County, Moss Printing, has specialized in helping customers with invites of all types. From wedding packets and mailings to graduation cards, and everything in between, let Moss help you get your invite out on time and looking spectacular. We can handle everything from graphic design to dropping it in the mail, depending on your needs and busy schedule. Why go to an online printing company, when you can personalize and proof your cards down the street at Moss Printing, with a real person helping you every step of the way? We offer full-service printing solutions, usually at cheaper cost and quicker turnaround than sending your project out of state. Waiting to see the quality of the print product to show up in the mail, that may not meet your expectations, is something of a gamble. Do you really want to risk getting an online print that is hard to return when time is running out to send it? We’ll help to make sure your information is correct, you print plenty of extras, you are on schedule for mailing the invites, and the project fits into your budget before starting the job. Why go anywhere else? Graduations, save the dates, religious milestones, anniversaries, birthdays, holiday parties, you name it. Having a party? Visit Moss first to print the perfect invite! Don’t forget to order your business cards, letterhead, envelopes and posters before you leave. Yes, we can handle that too, from design to delivery in the Kansas City area. Full color printing, basic black and white, foil stamping, specialty papers, ribbon bindery and whole wedding suite mailers can be done with Moss, your friends in the printing business. Moss is your invitation creation destination, if you want the best combination of price, service, turnaround and quality, hands down. Call today to get a quote and let us explain what we can do for you.